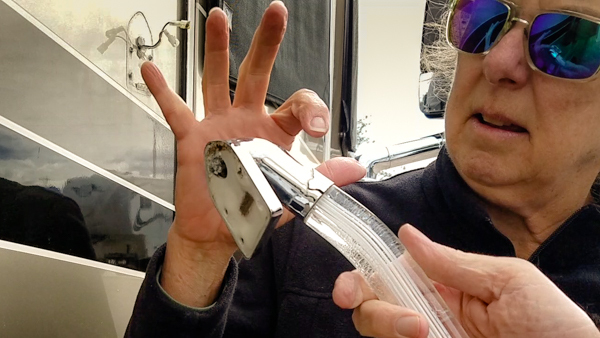 Now that we are settled in a park, we need to return to our lifetime project – repairing the motor home. Next on the list is our front door exterior grab rail. It is supposed to light up when the porch light is lit. Instead, the acrylic handle is badly crazed and the light has never worked for us. I have long advocated re-illuminating this rail. There is no such thing as too much light on a stairway at night. Plus I can use this guiding beacon to help find the RV in the dark. My internet research leads me to believe that I can replace the LED bulb in our existing rail. This seems the least expensive fix. I ask Storm to give me an hour of his patient guidance while allowing me to try and mend this myself. Against his better judgement, he reluctantly agrees. Knife Edge Split - danger to my fingers! 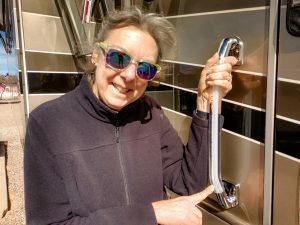 But before we arrive in Arizona, I exit the coach while at the same time sliding my hand down the acrylic rail to keep from falling out onto the ground. When my fingers graze the chrome bottom rail attachment I almost amputate them. It appears that the recent wet and cold somehow penetrated the chrome covering. The crack in the finish created a sharp edge at the bottom. Forget saving money, I need a rail that is not trying to injure me! While on our way west, the coach broke ANOTHER sway bar bracket. This is the third time we have broken one of these brackets. Since Storm has to order this part from Country Coach, he adds a replacement hand rail to his part order. He discovers that if we had purchased the rail 3 years ago when we bought the coach, it would have cost $50. A recent price increase raised it to $80. That is still about $400 less than we expected to pay so we are happy! The following video documents the closely supervised procedure I followed to replace this rail. Watch in amazement as Storm demonstrates remarkable restraint while he prevents me from severely damaging the coach as I install a new, crystal clear, lighted step rail. Glad some other girl likes to fix stuff like that besides me. You two have a beautiful motorhome!! Hope we see ya somewhere on the trail. Thanks for the encouragement :-)! Happy Valentines to you both also. Hope we cross paths soon too! The next job turned out to be replacing the water pump. I offered to try and tackle that but it involved creative engineering and working in a very small space. Storm did not believe he had the patience for me to undertake that one. Instead, I remained by his side to retrieve tools for him. We are warming up now thank goodness. Happy Valentine’s Day to you and Sandy! Yep he is pretty smart … hahaha! Good job! I got on the roof of the DRV today to try to help Matt. Didn’t last long…too scary!